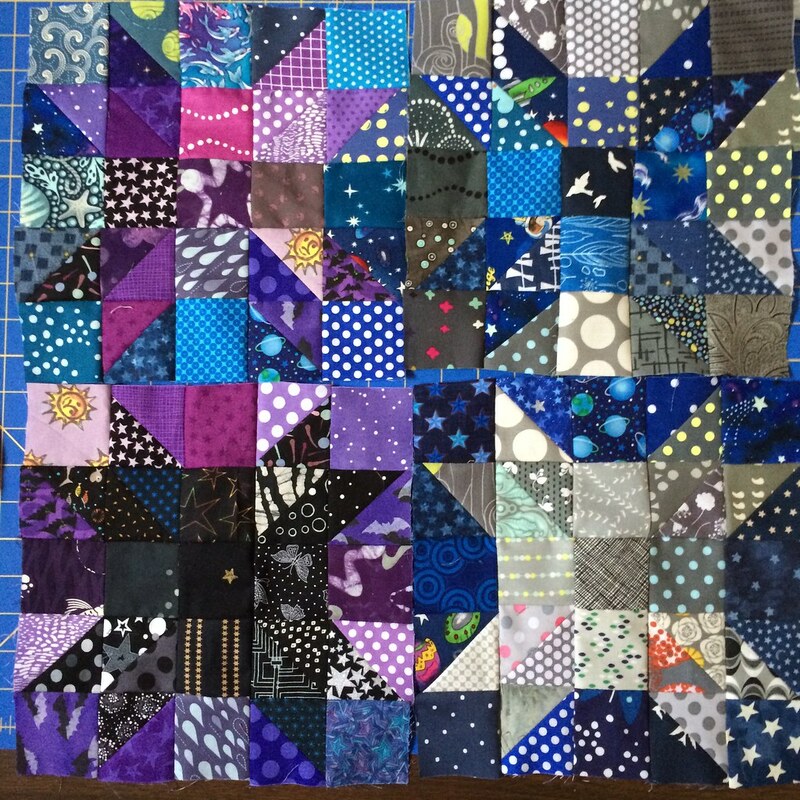 I got myself in a situation, with this quilt I'm making for my bed (which I have been making for a while now - it's a lot of piecing off little pieces, and it's not my top priority (or my priority top?)). 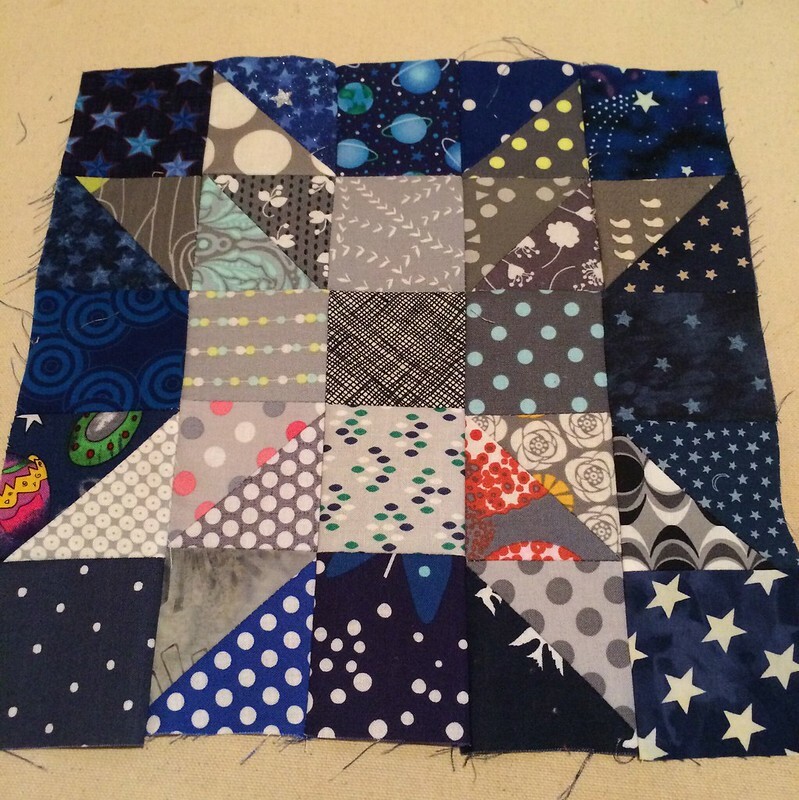 I began to piece a border that was 10" wide, which left me scrambling for cornerstones, which needed to be stars (one day, you will see the quilt and understand). 10" stars! 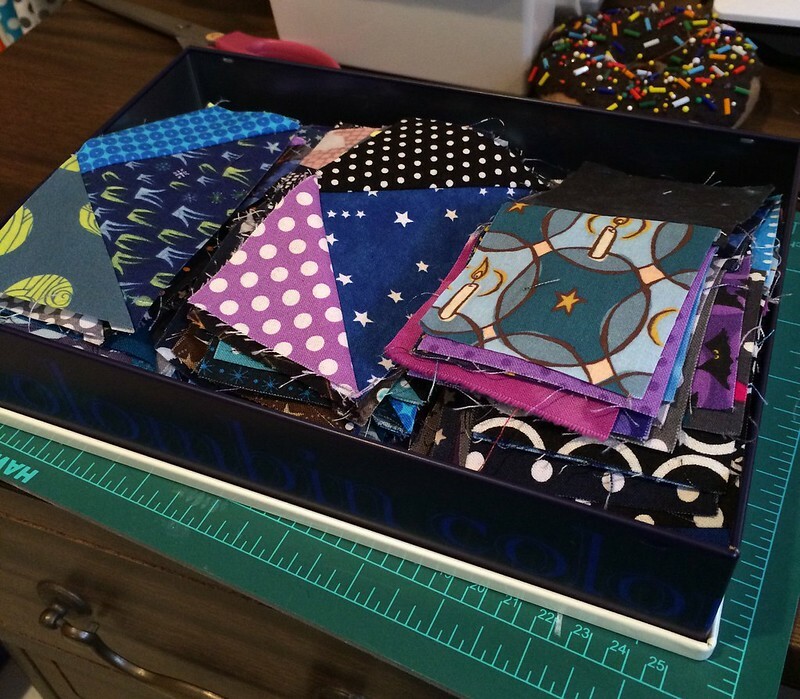 I turned to the trusty Quilter's Cache, which has an index of blocks by final size, and picked out a traditional block called the Farmer's Daughter. As usual, apparently, when I start with a traditional block, I moved the colors around - instead of a four color block, I made mine two colors - solid, well, sort of? stars. 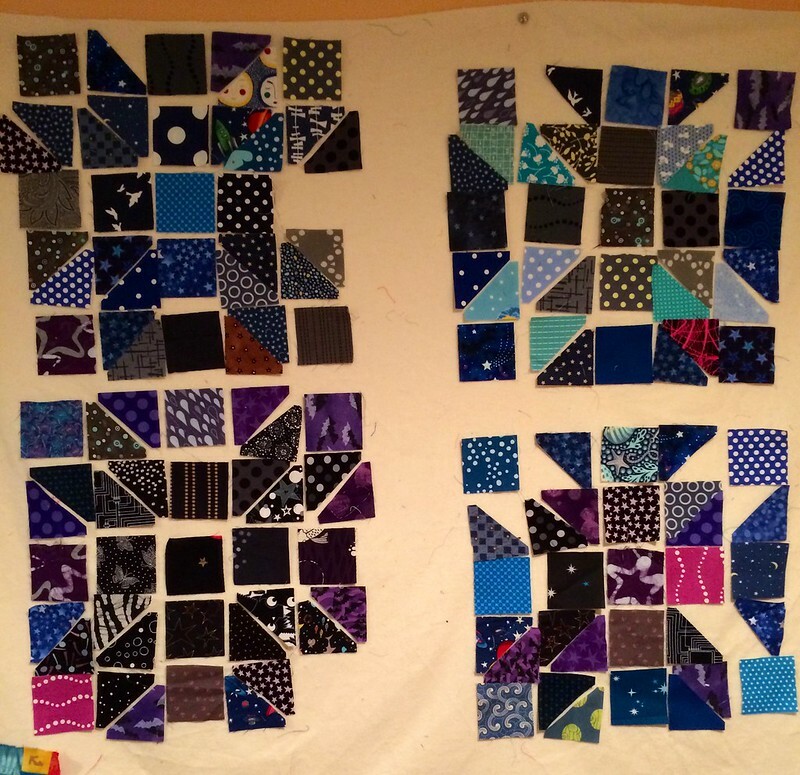 My quilt is blue, black, purple, and grey, and I wanted to do one star that was purple on a blue background, blue on a grey background, black on a purple background, and so on, meanwhile having no repeating fabrics, but I could not get that to work, so in the end I went with two stars with blue backgrounds. And the grey star was a close thing, too, if I had not gotten a few mini charms of Color Me Happy from a friend, I think would have had to forgo that color as well. Because we can't go back on our commitment to having no repeating colors, can we? If you notice down below, I was considering using teal to round out the grey star, but I could not arrange it in any way that made me happy. Anyway, I put a little time in last night assembling said border from blocks I made a few months back. Maybe tonight I will attach it to the quilt. It's a work in progress, this quilt, you see. Right now, it's only a bit bigger than a baby blanket. And I think it will need at least three borders before it is the right size for a queen bed. And I haven't totally decided what those should be, yet, though I've had several ideas. So, once this border is on, it will probably be heading back to the WIP pile for another round of hibernation. The aforementioned 10" border, when it was still in multiple pieces. But, it's going to be amazing when it's done! Even if that's a while from now... no rush, though, now that it's practically summer, right?